The watch, as it is known today, seems that it was invented in 1300, but there is no exact date for it. Tools for measuring time of day existed since antiquity. Egyptians built solar clock, obelisk. The hours were determined by the way on the earth’s shadows made by the sunlight. It helps to know what time of day there was. Also, another primitive model of measuring time is the hourglass. It is a glass bowl with two compartments. The top has a quantity of sand, water or mercury which could drop in to the bottom compartment in a certain period of time. The clepsydra has been used in Europe in the 14th century. The first public clock was made in Milan, Italy, in 1335. People did not have watches in their homes until the 14th century. In 1500 a German locksmith named Peter Henlein began making watches but those only had a small arm to indicate the time and not the minute or a protective glass top. These watches had the size of a hockey puck. But enough with history, today I want to talk about casual watches for men. For sure, every occasion requires its own style of watch to wear. So for a relaxed outfit you must choose a casual watch. 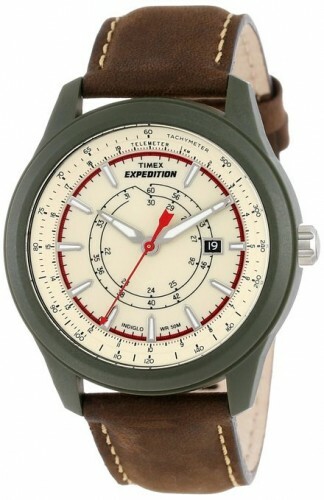 This is a great watch with a classic brown leather strap (very comfortable), high-tech solar-powered featuring a compass dial and a classic polished stainless steel case. Of course it also has Protective Hardlex crystal dial window. The watch has two buttons and two crowns. The main crown is for setting the time and date basically as any other analog. The crown at the upper left is only used to move the compass between directions one way or the other. It is perfect for a casual outfit. 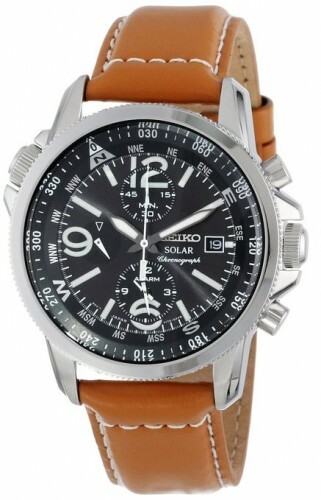 It is for now one of the best sold casual watch from Amazon . 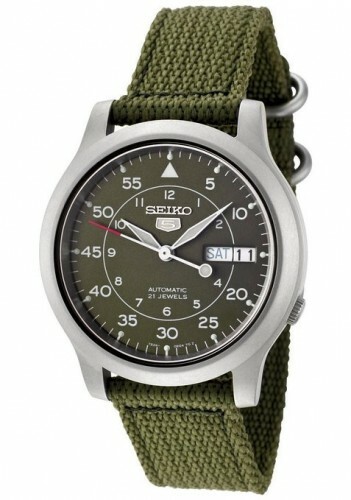 For sure it is a tough and masculine, Seiko’s military-inspired timepiece features a green dial nestled in a brushed stainless steel case and anchored by a green cloth weave strap. No wonder it has so much success. Of course it is water resistant to 99 feet. This watch is an automatic mechanical piece. Automatic watches do not operate on batteries; instead, they are powered automatically by the movement of the wearer’s arm. If the main spring in your automatic watch is not wound sufficiently, timekeeping may become less accurate. In order to maintain accuracy, wear the watch for 8 hours or more per day, or manually wind the main spring by turning the crown. 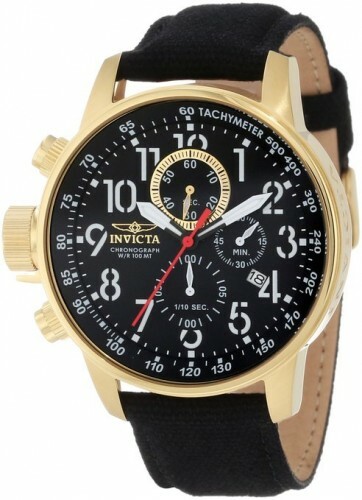 The quality and craftsmanship of this watch is pretty outstanding considering its price. For sure it has a very good value for the money. 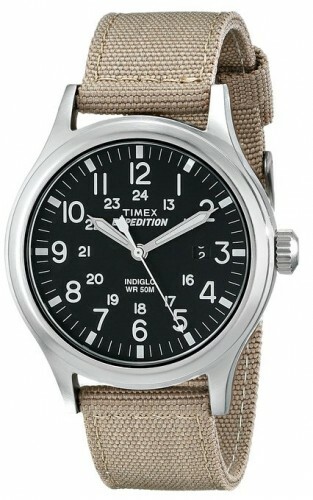 As the producer said this watch it is a is the perfect marriage of style and superior functionality. Indeed it is a quality watch perfect for your relaxed and chic style. Yes, because to dress relaxed and be comfortable is a style. An interesting watch which looks great as you can see and has a huge quality it is water resistant up to 330 Feet, which is something for this kind of watch. 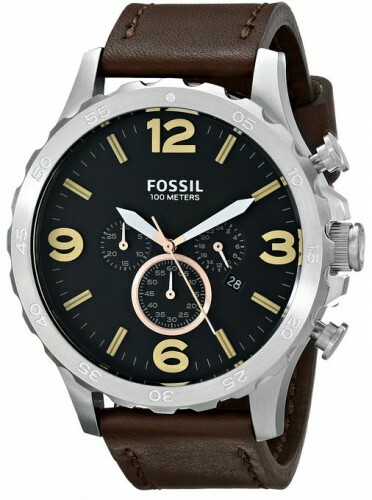 It is a brilliant looking watch and it is a great option for a casual wear. Quartz movement with analog display this are characteristic of this amazing watch. It is easy to read at a glance without being overly large. This watches it’s light weight compared to its looks. The band appears to be sturdy, but it is normal. Easy to read and with a very pleasant design looks great on a men’s hand.